Ipswich Town moved to within a point of Championship leaders Bournemouth with a convincing victory over Charlton. Defender Tommy Smith turned poacher, poking in at the near post from three yards, to give the hosts the advantage. Daryl Murphy headed home David McGoldrick's corner from close range to double Ipswich's lead after the break. And provider turned goalscorer when McGoldrick was put through by Murphy, making sure Ipswich extend their unbeaten league run to 11 games. Charlton, winless in seven matches, started the better of the two teams but as the match progressed they never seemed likely to topple the hosts, who have now won nine of their 12 home games this season. Ipswich, undefeated since October, threatened more as the first half progressed and went ahead when Smith reacted the quickest following a scramble in the box from a corner to score his fifth of the season. Charlton had their chances to equalise, with George Tucudean denied by goalkeeper Bartosz Bialkowski and Christophe Berra then clearing Johann Berg Gudmundsson's follow-up rebound off the line. But Ipswich quickly doubled their advantage after the break as Murphy's hot form in front of goal continued. The striker's header was his 17th of the season and his seventh goal in as many games, and the Irishman's form has been instrumental during a period when Ipswich have lost only one of their last 19 games. Mick McCarthy's men were dominant and McGoldrick, who hit the woodwork three times during the match, completed a satisfactory evening for the hosts as he slotted home beyond Neil Etheridge in injury time. 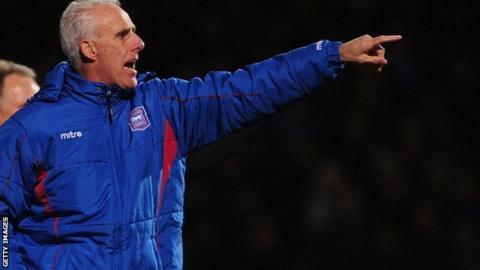 Ipswich boss Mick McCarthy: "It was a happy day, a good solid performance against a good side who had chances. "It was nice to get that backing from supporters but when the trust starts to come back, you can't let them down. Hopefully they will come back after that." Charlton manager Bob Peeters: "When you see the stats we should have won a few more games, but football is all about putting the ball in the net. "We didn't play a bad game but we lost 3-0 and that is hard for the boys. It is all about scoring goals and that is what Ipswich did and we didn't. That has been the story of the last few weeks and the story of our season." Match ends, Ipswich Town 3, Charlton Athletic 0. Second Half ends, Ipswich Town 3, Charlton Athletic 0. Attempt missed. Noel Hunt (Ipswich Town) header from the centre of the box is close, but misses to the right. Assisted by Stephen Hunt with a cross following a set piece situation. Jay Tabb (Ipswich Town) wins a free kick on the left wing. Attempt blocked. Kevin Bru (Ipswich Town) right footed shot from the centre of the box is blocked. Assisted by David McGoldrick. Attempt saved. David McGoldrick (Ipswich Town) right footed shot from the centre of the box is saved in the bottom left corner. Assisted by Daryl Murphy. Corner, Ipswich Town. Conceded by Tal Ben Haim. Goal! Ipswich Town 3, Charlton Athletic 0. David McGoldrick (Ipswich Town) left footed shot from the centre of the box to the bottom right corner. Assisted by Stephen Hunt with a headed pass. George Tucudean (Charlton Athletic) is shown the yellow card. George Tucudean (Charlton Athletic) has gone down, but that's a dive. Corner, Charlton Athletic. Conceded by Christophe Berra. Attempt blocked. Igor Vetokele (Charlton Athletic) right footed shot from the right side of the six yard box is blocked. Assisted by André Bikey with a headed pass. Foul by Tommy Smith (Ipswich Town). Attempt saved. George Tucudean (Charlton Athletic) right footed shot from outside the box is saved in the bottom left corner. Assisted by Chris Solly with a headed pass. Attempt blocked. Johann Berg Gudmundsson (Charlton Athletic) left footed shot from outside the box is blocked. Assisted by Frédéric Bulot. Attempt missed. Igor Vetokele (Charlton Athletic) header from the centre of the box is high and wide to the right. Assisted by Chris Solly with a cross. Attempt missed. Teddy Bishop (Ipswich Town) right footed shot from outside the box is high and wide to the right following a corner. Corner, Ipswich Town. Conceded by Joseph Gomez. Foul by George Tucudean (Charlton Athletic). Jonathan Parr (Ipswich Town) wins a free kick on the left wing. Substitution, Charlton Athletic. Frédéric Bulot replaces Johnnie Jackson. Substitution, Ipswich Town. Stephen Hunt replaces Paul Anderson. Delay in match Igor Vetokele (Charlton Athletic) because of an injury. Attempt missed. Johnnie Jackson (Charlton Athletic) header from the left side of the six yard box misses to the right. Assisted by Johann Berg Gudmundsson with a cross following a corner. Corner, Charlton Athletic. Conceded by Bartosz Bialkowski. Attempt missed. David McGoldrick (Ipswich Town) right footed shot from the centre of the box is too high. Assisted by Jay Tabb with a through ball. Goal! Ipswich Town 2, Charlton Athletic 0. Daryl Murphy (Ipswich Town) header from the centre of the box to the top left corner. Assisted by David McGoldrick following a corner. David McGoldrick (Ipswich Town) hits the bar with a header from very close range. Assisted by Jay Tabb with a cross following a corner. Corner, Ipswich Town. Conceded by Yoni Buyens. Attempt blocked. Daryl Murphy (Ipswich Town) left footed shot from outside the box is blocked.